My sitting room has a beautiful Edwardian half moon window that looks out on to the street - my neighbours opposite can look in. I inherited net curtains (ugh!). I also need curtains to keep out the draughts. I'd like to find a way of replacing the net curtains so I have privacy can can still enjoy the light. I'd like to have black out curtains that do not conceal the shape of the window when drawn. Grateful for your thoughts and suggestions! What about vertical blinds. These can be kept pulled but slanted to let in the light. 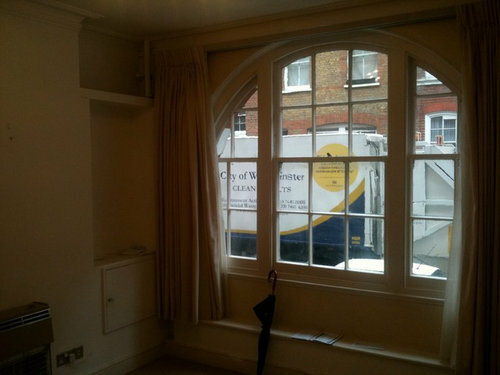 Unfortunately you have a catch 22 situation - you want to see the shape of the window, but want to cover it for privacy. One of those options needs rethinking unfortunately. How about applying frosting to the bottom half of the window as I assume nobody can see in the top. There are loads of places that do it with different patterns. I'm not fully convinced on this but we've inherited the same thing and it does work If you don't want to hide the window features. Alternatively a cafe style shutter may work although can't picture it with curtains in my head at the moment. You need privacy but still want to enjoy the light. Perhaps the solution is privacy film on the lower half of your window - this will allow to have your light and privace - try www.brume.co.uk - they have a pretty good selection. Then for your curtains, have some made that reflect the arc of your window frame when drawn so you still have an echo of the shape that appeals to you so much. This will give you your draught exclusion, black out and half-way meet your goal of the shape of the window. I would have plantation style shutters installed, both efficient in hot and cold weather. I have ordered them for my small living room as I have a 'front' door visible which is an eyesore but allows light in with a small porch Heinz. The shutter will disguise yet allow light. If you would like I can attach their website so at least you can get an idea. Hopefully I should have mine installed within the next month. Delivery is 6-8 weeks unfortunately. Here's my door I am trying to disguise. Small porch behind which gives a little more privacy when anyone walking past but with it being the end terrace there is a high wall from the property next door. 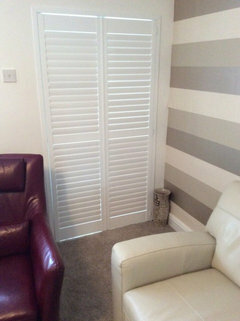 Perfectshutters.co.uk. Their site shows you actual houses with their shutters installed. I am so excited about mine as I believe it will make the room look bigger and more open. 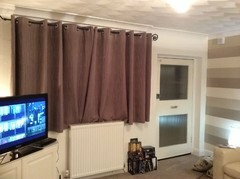 Curtains and rods seem to take up too much area and in the evening when drawn feels claustrophobic. Please check the or site as I am sure you will have similar companies in your area. I would think of having voiles put on a separate pole, which would be made the same way as curtains so you could open or close them. Then have curtains made to measure have them interlined to add a luxury feel about them and also helps keep the warmth in. So Don't have to much volume in them so they sit neatly at the side of the windows. Also I might think about having a padded fixed pelmet in the same shape of the window that would finish just above the shape of the window. 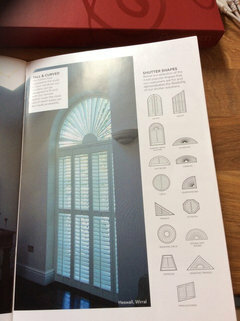 What a beautiful and unusual window shape - a lovely feature you naturally want to enhance. I just wanted to chip in to suggest - as other people have above - shutters, but to add that cafe-style shutters are a good solution as they shut out the lower half of the window while letting light in at the top. And although shutters do help keep out drafts, we also do total black-out shutters where the slats dovetail to block out light more effectively (obviously this type would need to cover the whole window - but shutters can be fitted to any shape), and also emphasise a window like your one beautifully. Good luck with your project. I will put some flowers in the window, outside or inside, so it gives you more privacy. 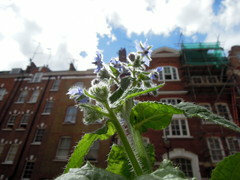 Good idea - I now have a window box! 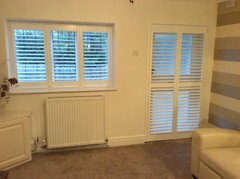 Just had plantation shutters installed. I cannot believe the difference. Will attach a before and after if I can. Very nice - I see what you mean! I found a photograph similar shape to your window that may work. 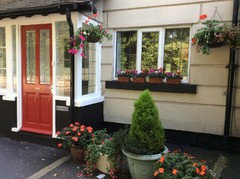 Just had a door and window shutter installed and they look elegant,clean and give more light if that's possible. Many thanks - I think this could work. I am waiting now for external building works to be done before I do anything - windows will be refurbished and I don't want fittings or curtains to be damaged! Good luck, I am so pleased with mine that I am going to get the other two front bedroom windows done. Delivery is about 6/8 weeks, and I would imagine it maybe similar timeline. Get some prices and If you decide to go ahead you will have time for your other repairs/decorations. 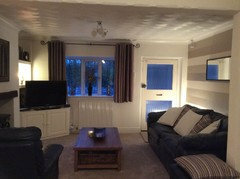 We lived in US for some time and brought furniture over and now we have moved into a smaller 1860 end terrace cottage, we also are in the process of replacing furniture to make room brighter. Is your room dark? Probably sheer curtain with dark curtain over it. 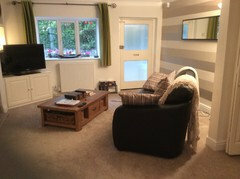 I came across this photo in Houzz and thought you might be interested. Hi Edward, have you considered bottom up blinds? 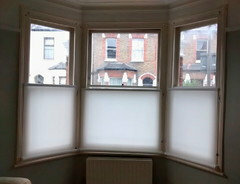 They roll up from the bottom and are perfect for windows like yours, giving you privacy without blocking all the light. They can be made from a range of fabrics including blackout fabric. Take a look at some examples we have installed with similar situations to yours. Thanks, I'm still pondering what to do! 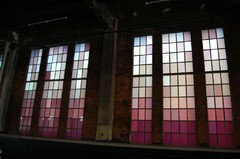 I think the window is stunning and would be reluctant to cover it. This window is a diy project from Martha Stewart website. It doesn't seem to exist now, l imagine it was simple glass paints. 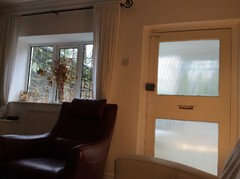 Expensive, but it is possible to get double glazed stained glass units made up that can fit original joinery, if the glazing bars are thick enough. We have vertical blinds but do find they can be temperamental - crossing over each other, getting stuck in the tracks etc and sometimes the little loops between them break (we have children...). 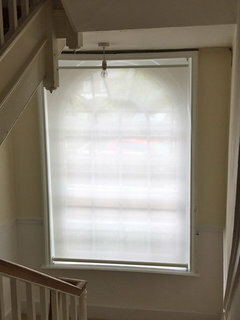 Also if you have any damp or condensation on that window it can make the blinds a little grotty after a while so they need an eye keeping on them for that. The frosting or otherwise obscuring the lower part of the window from outside view is a smart idea as you retain the joy of the shape from inside. In the Netherlands (and other countries do it too I'm sure) I saw lots of little window displays facing onto the street which were quirky and did block the view into the house. 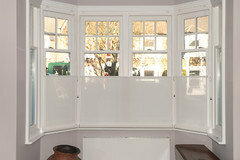 Blinds or Curtains on gable end windows? What type of curtains or blinds for this bedroom? what type of curtains or blinds for this open plan living area? Blackout for arched window (curtain/blinds/shutters)?